Pick someone from around your neighbourhood! 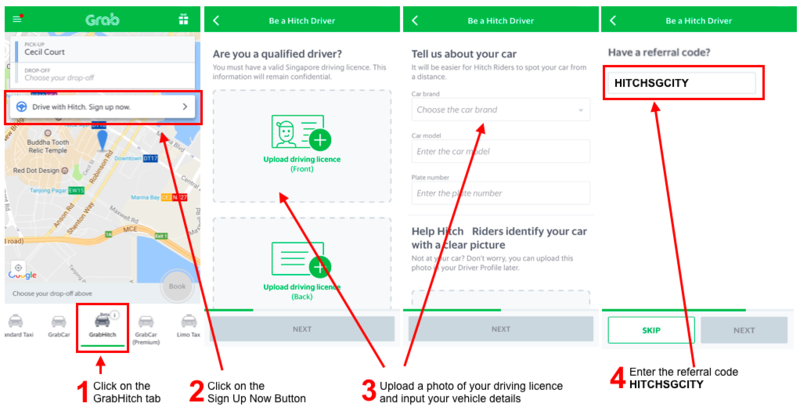 4 Simple Steps to Signing Up as a Driver – right from your mobile phone! You MUST enter your referral code HITCHSGCITY to get your $20 credit after you completed your first GrabHitch ride as a GrabHitch driver. This incentive is only eligible for new drivers who sign up and successfully complete 1 Hitch ride as a driver between 11th January 2017 @ 00:00 hours – 28th February 2017 @ 12:00 hours. New drivers must sign up with the referral code HITCHSGCITY in order to qualify for the $20 credit incentive. If you’re still not sure how to sign up, or have any questions regarding GrabHitch, email us at grabhitch@grab.com with the Subject: HITCHSGCITY and we will get back to you in 1-3 working days.